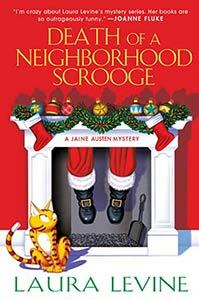 It’s ho-ho-homicide when Jaine gets a job house sitting in ritzy Bel Air and her next door neighbor, an embittered former child actor and Scrooge Royale, detested by one and all, is bludgeoned to death with a frozen chocolate yule log. Jaine sets out to find the killer—all the while slogging through a series of internet dates from hell and watching in dismay as her fickle cat, Prozac, falls madly in love with Scrooge’s beautiful young widow. 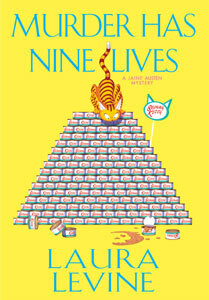 Don’t miss this merry mix of murder, mayhem, and Worst Dates Ever! 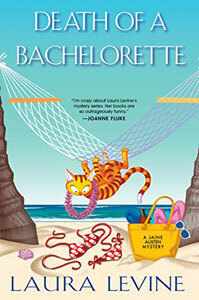 Jaine lands a gig writing dialogue for a "Bachelor" show rip-off being shot on an island in the South Pacific. She sets off with Prozac, dreaming of glorious days in a tropical paradise, only to wind up fending off waterbugs the size of golf balls, the advances of a lovestruck native tribal king, and trying to keep Prozac from wrecking havoc on the set. All this--and murder, too, when one of the backstabbing bachelorettes gets bumped off in the middle of the shoot. Will Jaine find the killer? Will she win the battle of the waterbugs? Most important, will she have the nerve to appear in public in a bathing suit? The answers to these burning questions and many more are waiting for you in DEATH OF A BACHELORETTE. It’s Lights! Camera! Action! when Jaine’s cat Prozac gets tapped to star in a cat food commercial. Jaine shows up at the shoot with visions of royalties dancing in her head, only to have them dashed when the egomaniacal inventor of the cat food is murdered on the set. Will Jaine find the killer? Will Prozac make it in show biz? Will Jaine find the love of her life when she starts dating her boss’s hunkalicious nephew? Tune in and find out! Jaine gets hired by an uber-pushy pageant mom to write novelty lyrics for her teenage daughter in the Miss Teen Queen America beauty pageant. Jaine watches in disbelief as pageant moms go at each other like cougars at feeding time. Backstabbing, name-calling, and hair pulling abound. And that's just at the registration desk. 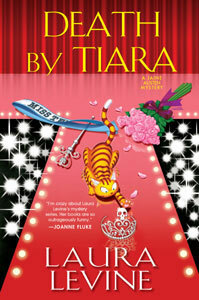 When one of the pageant staff is killed after the talent show, Jaine's client is the leading suspect. Jaine sets out to find the true killer—all the while trying to impress the insufferably stuffy parents of her hunky new boyfriend. Just in time for Valentine's Day, Jaine starts writing advertising copy for a Matchmaker from Hell—a ghastly gal with a penchant for lying, cheating, backstabbing and blackmailing. (And those are her good points.) 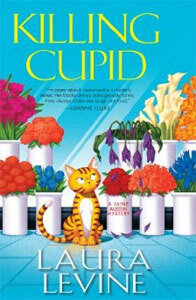 When the chiseling cupid is murdered, Jaine sets out to find the true killer, all the while fending off the advances of a billionaire septuagenarian who's fallen madly in love—with her cat Prozac! 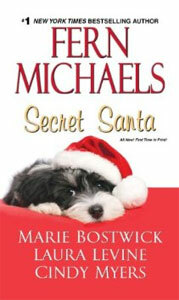 One of four novellas in a Christmas-themed anthology. When Jaine gets a gig as a Santa's elf, she can't decide which is worse: Having to wear a hideously unflattering elf costume, or discovering Santa dead next to the Christmas tree. It's a "Nightmare on Elf Street" you won't want to miss! Jaine is the cops’ number one suspect when her witch of a neighbor, Cryptessa Muldoon, is found stabbed to death on Halloween night with her own Do Not Trespass sign. Will Jaine exonerate herself and find the true killer? 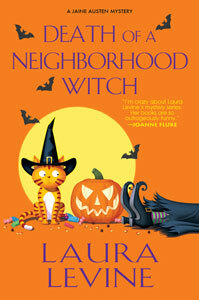 Will she win the affections of a hottie new neighbor up the street? And most important, will she make it through the night without eating all her Halloween candy. Jaine sets off for a fancy health spa, thinking she's in for a week of pampering and papaya smoothies—only to learn that the place is a 900-calorie-a-day diet boot camp! Murder soon shows up on the menu, and Jaine spends the rest of the week searching for both the killer and something decent—as in "Chunky Monkey"—to eat. 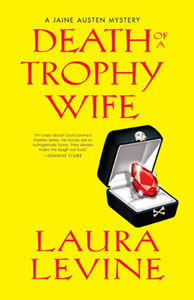 It’s murder among the Rich and Surgically-Enhanced as Jaine tracks down the killer of a venomous trophy wife—a woman with an enemies list as long as her hair extensions. And if nabbing a killer weren't enough, Jaine must also fend off the advances of Vladimir Ivan Trotsky, an internet Romeo who shows up on her doorstep all the way from Uzbekistan, hoping to woo her with bad poetry and pictures of his goat Svetlana. Don’t miss this stirring saga of murder, mayhem and dates from hell! When Jaine gets a job lecturing on a cruise ship, she sets sail hoping for a week of fun in the sun—little dreaming that she is about to wind up with a killer at her dinner table—and a stowaway cat in her cabin. Jaine signs on to write wedding vows for the ultimate Bridezilla. But “I do’s” quickly become “Oh, no’s!” when the bride plummets to her death on her wedding day in this haunting tale of murder, malice, and bridesmaids out for revenge. Jaine gets a job writing jokes for a female stand-up comic—only to discover that comedy is no laughing matter when her client gets arrested for strangling her arch rival with a pair of control top pantyhose. 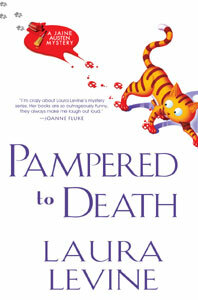 Don’t miss this true life adventure of murder, romance, and spandex undergarments! Jaine joins a women’s support group, looking for friendship and free margaritas, only to wind up as a murder suspect when one of the club’s members is poisoned by a dose of deadly guacamole. When Jaine—a gal who thinks Dolce E Gabbana is an Italian ice cream—lands a job writing ads for a trendy clothing boutique, she’s in for a challenge. Especially when she finds Frenchie, the boutique’s most detested employee, stabbed in the neck with one of her own stiletto heels. Join Jaine in this fashion disaster of deadly proportions. With her checking account on life support, Jaine can’t afford to say no when an arrogant Martha Stewart wannabe offers her a job ghostwriting a book of hostess tips. Her hellish job comes to an abrupt halt, however, when Jaine discovers her boss electrocuted with her own hair dryer in this hair-raising tale of murder on the party circuit. 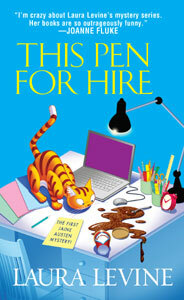 Jaine lands a dream job—on the staff off a Hollywood sitcom. But the dream quickly turns into a nightmare when the star of the show gets poisoned by a deadly donut, and Jaine’s best friend is the cops’ Number One Suspect. Join Jaine as she fights for truth, justice and one-liners in this expose of Hollywood at its deadliest. In her debut adventure, freelance writer (and Ben & Jerry’s addict) Jaine Austen writes a love letter for a guy, hoping to land him a date with the woman of his dreams—never imagining he’ll wind up arrested for her murder! Awash with guilt, Jaine sets out to find the real killer, thereby becoming the world’s first private eye with a Chunky Monkey habit. and at Dreamscape Audio Books! Site design & maintenance by wallacewebs.com.